Cyclists like to say that the Vipava Valley, with all there is to see, is best experienced on two wheels. Legendary road ascents and descents, twice included in the famous Giro d'Italia, as well as the thrilling inclines of the mountain trails offer challenges that are simply a must for any active cyclist. Naturally, less demanding lanes also abound, and even a casual ride around the Vipava Hills will not leave you indifferent, we promise. 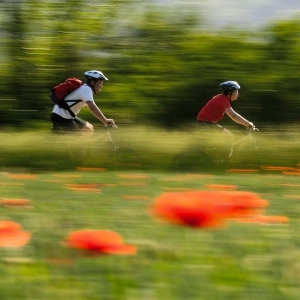 Any time of the year, the Vipava Valley features a cycling trail worth taking. The Vipava Valley has just one cycling season: the entire year. Road cyclists enjoy such a large selection of trails they can plan a perfect run during any season. When the Burja wind starts blowing, the locals will gladly suggest less exposed trails. In the winter, the southern hills are almost always clear of snow, and ascending the Kras side is accompanied by pleasant temperatures. Even in the coldest months nature is mostly kind in the style of the Mediterranean. In the summer, when temperatures in the Vipava Valley can sometimes rise to tropical levels, cyclists can escape the heat at their whim. On the plateaus above the valley the air is significantly cooler, especially in the depths of the Trnovo Plateau’s forests and the outskirts of Mount Nanos in the direction of Hrušica. Asphalt and macadam roads leading through living woods are a proper summer hit with cycling enthusiasts. True, experienced mountain bikers aren’t afraid of a little bad weather, but in the Vipava Valley you can avoid it altogether. 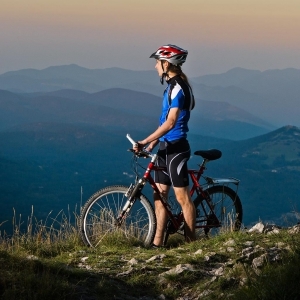 Biking guides know all the best trails and advise those most suitable and enjoyable at any particular time of the year. Have you ever ridden under swaying treetops as wind rustles through, the air just cool enough for a pleasant ascent along a colourful single trail? In the Vipava Valley, the experiences are uniquely special. All year round. The striking variety of cycling trails puts the Vipava Valley on the map of Slovenia's top cycling destinations. If you're looking for proper challenges, this is the place to visit. The Valley's roads and mountainside single trails provide perfect inclines for serious tests of endurance. Lengths are easily customized, since the local trails can be connected to those of the Kras region or even Italy. Thus, the Valley is a perfect base camp for longer cycling runs in several directions. Of course, recreational and nature-loving cyclists can also enjoy easy trails here. By the rivers and the feet of the Vipava Hills, novice and younger cyclists will find lovely trails tailored to their abilities and designed to be family-friendly. Sooner or later, each of them brings its riders to the doorstep of a Vipava Valley tourist farm where tasty refreshments await.